Pay-TV broadcaster BSkyB has become the latest media company to jump on the so-called "triple play" bandwagon. With its £211m ($374m) purchase of Easynet, BSkyB will soon be able to offer broadband and telephony services, as well as its current satellite TV service. Not only will the deal allow the broadcaster to tighten its grip on the Pay-TV market, it will also enable it to diversify into other areas - picking up key subscriber numbers as it widens its horizons. Redwan Ahmed, analyst at Oriel Securities, said the purchase was a "good, strategic long term move" for BSkyB. "The move will enable Sky to control the pay-TV platform," Mr Ahmed told BBC News. Despite having near blanket cover of the UK, the broadcaster is unable to send its satellite signal into almost two million of the UK's 24 million TV households - so Easynet will allow it to offer an alternative route through its digital subscriber line network. While the acquisition will allow BSkyB to offer hybrid internet and satellite delivery platforms in line with plans outlined last month, that was not the reason the firm swooped on Easynet. The telecom firm's investment in "local loop unbundling" (LLU) - the process that involves putting equipment into BT exchanges so companies can control the line into homes and offer a range of services - made it a more attractive proposition. Now BSkyB will be able to stand in direct competition to BT and rival cable firms like NTL, according to Numis Securities. "It's clearly a major strategic move for Sky, there's multi-benefits," Ian Fogg senior analyst at Jupiter Research said. He added that by snapping up Easynet, Sky had managed to buy into expertise and network coverage - and although it would probably have to invest more money in the services it had bought a solid "foundation to work from". "The UK only has two serious players on the local loop unbundling front - Bulldog and Easynet, and Bulldog has already been bought by Cable & Wireless," Mr Fogg said. The "interesting thing", he said, would be the diversification of BSkyB's offering. Easynet is operating out of 232 telecoms exchanges and expects to move into 350 by 2006, giving it access to 5.8m households. Through that network, BSkyB will be able to offer "old fashioned" telephone network calls. However, it also has plans to expand into the burgeoning market for Voice over Internet Protocol (VOIP), a technology which allows people to make calls which are carried over the internet rather than through traditional telecoms networks and are therefore often much cheaper - if not entirely free of charge. Already Microsoft, Google and Ebay have made their mark in that arena, with Ebay buying internet phone firm Skype for £1.4bn ($2.6bn). The new deal will also allow BSkyB to reach its target of signing up 10 million subscribers by 2010 - something that is becoming increasingly difficult to do within the "fairly mature" pay-TV market. 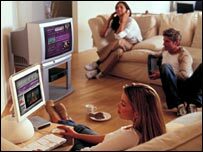 At present, an estimated 12.7 million households do not subscribe to pay-TV, by opening itself up to new markets and unveiling its three-pronged product offering BSkyB may now be able to take advantage of these homes. Like its rival NTL, BSkyB will be able to use its broadband as a means to sell its pay-TV and telephony packages to subscribers, Mr Fogg added. "Broadband is a dynamic and growing market where it's easier to acquire customers, therefore it gives Sky a platform to get customers through a different route," said Mr Fogg. With only just over half the UK's internet connections hooked up via broadband, according to the Office for National Statistics - and only 60% of the population using the internet at all - that leaves a huge customer base up for grabs.